“No sooner had the plane touched down from a fabulous trip to Italy working with Angela Hewitt at the Trasimeno Music Festival, than rehearsals began to complete our Nielsen CD. Working with the ever good-humoured and fabulously patient Richard Hughes and Susanne Stanzleit, we found ourselves again in Meridian’s renowned “Natural Sound” recording venue. This little church is famous amongst performers not only for its excellent natural acoustic, but also for being under a Heathrow flight path! 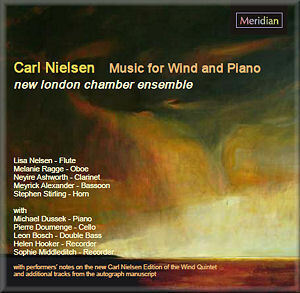 The CD includes Nielsen’s works for winds and piano which we were delighted to be recording with guest pianist Michael Dussek (Fantasy for clarinet and piano, Fantasy Pieces for oboe and piano, Canto Serioso for horn and piano, two miniatures for flute The Fog is Lifting and The Children are Playing for flute solo). Mike also recorded three beautiful works for solo piano (the Three Pieces Op 59); and, of course, the recording includes that centrepiece of the Quintet repertoire – the Op 43 Wind Quintet. The chamber music of the internationally-respected composer, John Woolrich, is both intense and private. As fellow composer and writer, Robin Holloway, notes “his music whispers, whirs, rustles, creaks, and shines with a gentle light, often elegiacal”. 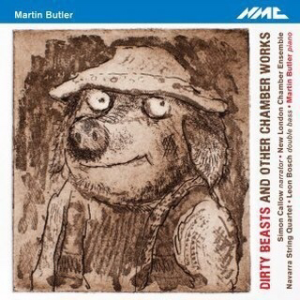 Nowhere is this more apparent than in his works for wind instruments and piano, played sensitively and passionately in this recording by the New London Chamber Ensemble with the accomplished pianist Julian Jacobson. 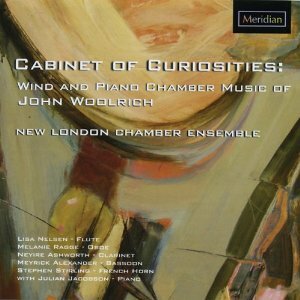 This CD, originally conceived as a celebration of Woolrich’s 50th Birthday, also includes previously unrecorded works written especially for the New London Chamber Ensemble. Lennox Berkeley amassed over 100 works and contributed to almost every genre. Since he had the opportunity to write for some of the leading performers of the time—the Horn Trio was written for Dennis Brain—chamber music featuring wind and strings held a particular attraction. The Sonatina can also be performed on recorder and piano; in which guise its artless amalgam of Baroque and neo-Classical traits has ensured its popularity. The Viola Sonata is among the more sombre of Berkeley’s works and perhaps reflects something of the times—the aftermath of the Second World War—in which it was written. 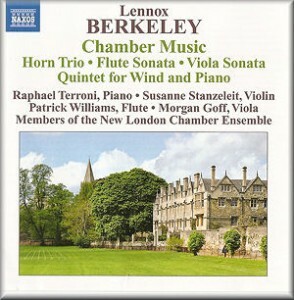 The Quintet for wind and piano is among the more extended chamber works from Berkeley’s later years.